Haddock is a white, flaky and lean fish that tastes mild. For the beginners this type of fish is an excellent choice, as it doesn’t have strong fish flavor typical to these animals. It is a common fish in the North Atlantic and is fished for commercial aims. You can find them in supermarkets fresh or frozen. It is a good source of protein and it radically low in fat. It is a diet-friendly seafood product, as has no carbohydrates. The key to keeping it low in fat and calories is the preparation method. It cooks well when grilled, broiled or baked. Halibut is the largest one among flat and salt water fish and it has been a vital food source for Native Americans and Canadians for thousands of years. When they are born their two ayes are located on one side of their head, then after 6 months one of them moves to its place. Its meat is adorable for fish lovers due to its delicate flavor and high nutritive value. Fresh ones are available in summer, whereas frozen ones are available all year around. It is often served baked, broiled and grilled. When looking at the comparison chart of minerals, it becomes clear that both of these fish are equally high in minerals. The amounts of copper, magnesium and zinc are almost the same in both of them. Although, halibut contains 3 times more iron compared to the other fish, whereas haddock contains 3 times more sodium than the other fish. Two of them are high in potassium and phosphorus, though haddock contains a bit more of them. When speaking about vitamins, the comparison charts tell us that halibut is a winner here with a score of 4:5. It is a great source of Vitamin D and its amount is more than 47 times higher than in other fish (in 300gr). From the other hand, haddock is 2 times richer in vitamin B12 and B5 than the second one. They contain equal amounts of vitamin K and B2, whereas halibut is 2-3 times higher in vitamin B1 and B3 (based on 300gr comparison). From nutritional viewpoint, halibut wins, as it contains more calories and fat than the other one. They contribute to maintaining cells thanks to considerable high levels of vitamin B12. Its role for repairing, formatting and maintaining red blood cells is of vital importance. It is useful for nervous health as well. Vitamin B12 also enhances stamina in body and provides relief from weakness and fatigue. The functions of digestive system are supported by vitamin B3. It also stimulates appetite, nerve function and glowing skin. The intake of this vitamin is also useful for lowering cholesterol and prevents atherosclerosis. The consumption of this fish helps to restore and renew cells and tissues thanks to amino acids. It is crucial for nails, hair and skin. Health ailments like numbness, muscle weakness and fatigue are possible to prevent due to the phosphorus levels in halibut. It also contributes to sexual activity, frigidity, sperm motility and so on. This fish is rich in Potassium, which plays significant role in maintaining brain functions like learning and memory. Furthermore, the lack of potassium can cause epilepsy. It also lowers stress, and is useful for depression, anxiety and mind fitness. Due to the high level of Magnesium, it prevents heart ailments, vomiting, indigestion, flatulence, constipation and so on. This seafood is high Vitamin B12, which is responsible for the maintenance, repair and formation of red blood cells and nerve health. It is a wide source of protein, which is essential for stronger immunity. It is important for the proper work of body’s self-defense mechanism to struggle against diseases and infections. It also balances the fluid level in our body. The deficiency of fluid may cause the proper function of nerve and muscle cells. For effective digestion our organism requires phosphorus. It contributes to the digestion of riboflavin and niacin that are important for emotional and neurological response systems. It is also able to eliminate toxins from the body. The cognitive development and growth require considerable amounts of phosphorus. The brain function will also deviate because of the lack of this mineral. By consuming this fish we can keep away such diseases as artery thickening and atherosclerosis. The reason is that its high intake lowers the level of LDL cholesterol (bad one) and increases HDL cholesterol. Skin conditions like eczema, dandruff, dry skin and hair loss will be no longer a problem when consuming halibut fish, as it is a great source of vitamin B6, essential for skin health. It is also possible to avoid ailments like psoriasis and melanoma due to the vitamin B6. The regulation of hormones responsible for proper mental conditions is done due to pantothenic acid. Its proper intake will reduce stress and mental issues like depression and anxiety. A proper level of potassium and sodium is necessary to avoid headache, sweating, weakness, trembling and nervousness. The intake of this fish relatively lowers that risk and is useful for diabetic patients, as lowers sugar level. For the contraction and relaxation of muscles our body requires potassium. It also keeps the function of nerves and optimal muscles in right level. Precaution: Pregnant women and allergic people should avoid it due to the high content of mercury. Thus, summing up, we should state that both of them are useful for various health issues, and are just irreplaceable for formation and repair of nail and hair. 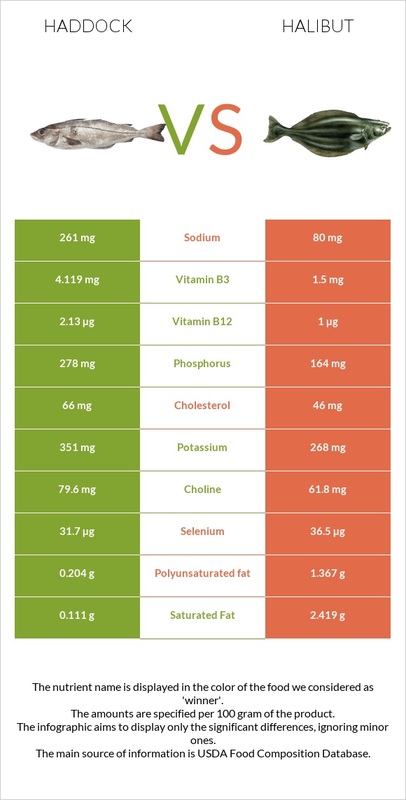 And finally it should be highlighted that both haddock and halibut contain almost equal amounts of minerals, whereas halibut is higher in vitamins in contrast to the other one. It is enough to mention that halibut contains 47 times more vitamin D than haddock.